18.2 was released a few days ago, so I thought I’d throw it against my 18c instance and see how things played out. This was just a single instance database, running with a single pluggable. Step 1 for me was to download the latest OPatch. To be honest, I don’t even check whether I already have the latest version in any installed ORACLE_HOME anymore. If I’m going to apply a patch, I’m always going to download the latest OPatch unless the README explicitly tells me some reason why I should not. I figure getting the latest version reduces the chances I’ll hit problems. For me, I grabbed version “12.2.0.1.13”, but your experience may differ depending on when you encountered upon this post. 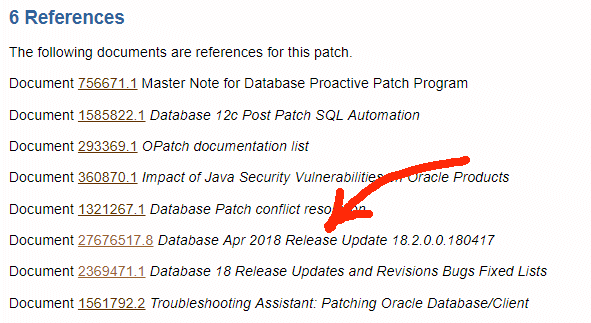 So I then downloaded patch 27676517 (note, this does not include patches for the JVM which are done separately). ApplySession: Optional component(s) [ oracle.assistants.usm, 18.0.0.0.0 ] , [ oracle.has.crs, 18.0.0.0.0 ] , [ oracle.network.cman, 18.0.0.0.0 ] , [ oracle.assistants.asm, 18.0.0.0.0 ]  not present in the Oracle Home or a higher version is found. And the datapatch stage to update the database(s) also went through without any problems. Copyright (c) 2012, 2018, Oracle. All rights reserved. So all in all, a painless and straightforward experience for me. then you will get to the document which contains the list of fixes etc. and follow the various links within that post for more information.